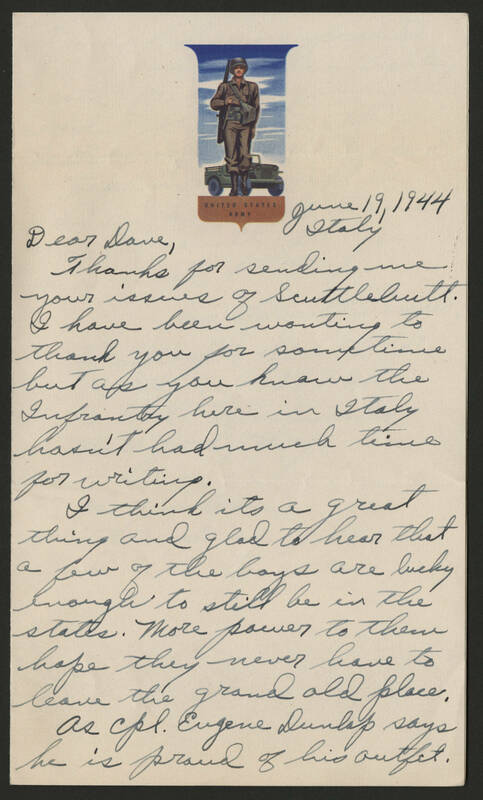 June 19, 1944 Italy Dear Dave, Thanks for sending me your issues of Scuttlebutt. I have been wanting to thank you for sometime but as you know the [Infrantry?] here in Italy hasn't had much time for writing. I think its s great thing and glad to hear that a few of the boys are lucky enough to still be in the states. More power to Them hope they never have to leave the grand old place. As [Cpl.?] Everyone always says he is proud of his outfit.